The simulation of promotional competitions in corporations described herein allows comparisons of suggested reasons for the paucity of women in the highest level of corporate management. Runs with small, medium and large-sized companies all give similar results. The strongest effect is evidenced when men are given a bonus in performance evaluations. Similar stratification is observed when men's scores are drawn from a distribution with increased variance. Other explanations (increased female attrition, career delays for women, line-staff divisions, and external labor market) do not, by themselves produce strong gender stratification, but could add to that produced by biased evaluations. Women currently make up a small proportion of top-level management in large corporations despite that fact that approximately half of all managers are women. Numerous reasons have been advanced to explain this disparity but the complexities of competition for managerial positions make it difficult to collect data which would allow comparisons of the explanations. This article introduces a computer simulation of the promotional process which allows comparison of some of the proposed explanations for gender stratification in organizations. The following factors are considered: bias favoring men in performance evaluations, higher female attrition rates, greater frequency of short-term absence among women, increased risk-taking by males, a super-majority of males in the external labor pool, and differences in route to the top (line versus staff positions). Simulation runs were used in two ways: firstly, where data are available to provide reasonable values for tuning parameters, simulations provide a means of measuring potential effect sizes. Secondly, for potential male-female differences in measures which have not been reported, simulation runs were used to examine how large tuning parameters would have to be in order to elicit effects of the size observable in large corporations today. Gender bias is shown to have a strong direct effect; only increased risk-taking by males has an effect of similar magnitude. The other explanations certainly might augment and magnify the bias effect, but for reasonable parameter values, do not seem to have strong effects by themselves. The organization of this article is loosely based on the suggestions of Richardi et al. (2006) for reporting the structure and output of a simulation. Section 2 describes the possible explanations for gender stratification which we will consider and provides references to the psychology, sociology and/or management literature for each. In section 3 the basic structure of the simulation is presented. The implementation is described in section 4, replication and validation in section 5. We conclude with discussion in section 6. Recent data on the gender makeup of managers of Fortune 500 companies indicate that roughly half of managers are women, but only 16.7% of the upper level managers (defined as positions whose occupants are elected or approved by the board of directors) are female (Catalyst 2006). The same source counts only 8 women CEOs among the Fortune 500 in 2005 and notes that the proportion of women near the top has increased very little in the past three years. Extensive literature on women in management has proposed a variety of explanations for the glass ceiling, six of which have been built into the simulation described herein. We begin with a brief discussion of each of the posited explanations. Six meta-analytic reviews (Bowen, Swim, and Jacobs 2000; Davidson and Burke 2000; Swim, Borgida, Maruyama, and Myers 1989; Swim and Sanna 1996; Eagly, Makhijani, and Klonsky 1992; Olian, Schwab, and Haberfield 1988) confirm that the work performance of females is evaluated less favorably than that of males both in controlled laboratory settings and in field studies. The effect of gender is typical described as of "small" size, explaining between 1% and 5% of the total variance of performance scores. More recently, Lyness and Heilman (2006) reported that of those promoted into the upper levels of the corporation, the mean performance score of men was roughly half a standard deviation lower than the mean for women who were being promoted alongside them (r2 = 5.5%). The difference in means suggests that men are given some advantage in the same way that we will operationalize bias. where pm is the proportion male at a given level. Managers in large corporations can be described as having "line" or "staff" responsibilities where line responsibilities have a direct impact on the profit/loss of the company (e.g., manufacturing and marketing), and staff positions play a support role (e.g., human resources). In Wellington et al. (2003) and Catalyst (2006) quotes from CEOs indicate that line experience is a necessity for promotion into the top levels of the company. Historically, women tend to hold a higher proportion of staff positions - 21.1% (Catalyst 2006) - than line positions (10.6%, ibid.). In the simulation we can split the company into line and staff positions which operate like unrelated companies. At the top of the staff pyramid, however, further promotion is limited by a preference for line over staff senior managers. In our virtual company, the strength of preference for line over staff and the ratio of line to staff positions can be set. Rosin and Korabik (1990) cite anecdotal evidence that women with MBAs have higher attrition rates than men, but investigations cited in Cox and Harquail (1991) are not as clear-cut; some researchers have found little difference in career paths between men and women. The simulation has separate rates of random attrition built in for each gender/level combination. Research on work-family conflict and career delays is mixed. Powell and Mainiero (1992) describe how women choose different career paths than men. Cox and Harquail (1991) discuss the role of work-family conflicts in career paths of women. In Wellington et al. (2003), surveys of women vice presidents and of mostly male CEOs indicate that 67% of women who have reached upper levels see balancing work and family as a barrier to women but only 35% of the CEOs agree. Stroh, Brett and Reilly (1992), however, found significant gender disparities among senior-level manager's salary progression even controlling for family status and career delays. 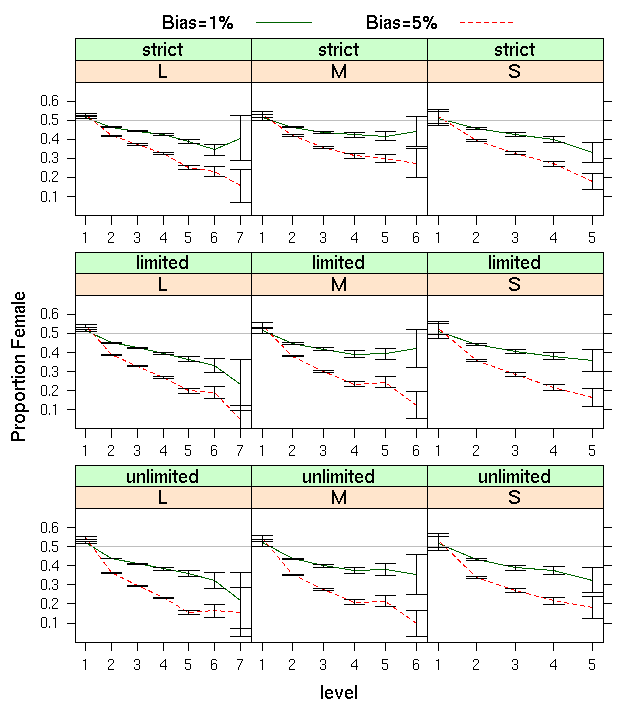 The simulation provides a delay factor for women which removes women at random from a candidate pool for one year (the proportion delayed is set by the user for any simulation run). That in itself is only a slowing effect, not a filter, but it can be combined with a strict time window which penalizes people who have too many years-in-rank. Several studies (Brett and Stroh 1997;Konrad and Pfeffer 1991; Lyness and Judiesch 1999) have shown that external labor pools are skewed to contain higher proportions of men than women. If companies tend to hire external candidates into higher level management positions, the proportion of women will be affected by the imbalance in the external pool. One can set the probability of an external hire at each level of the simulated company, and one can set the proportion male in the external pool for each level of the company. Schubert (2006) reviews the literature about risk-taking preferences for men and women and concludes that women are more risk-averse in general. To build relative degrees of risk-taking into the simulation, we reason that taking a risk increases perceived performance score when the risky decision brings success and reduces the score when the risk-taking results in failure. If the positives and negatives balance out in the long run, then mean performance score is unchanged, but risk-taking would increase variance. Based on that reasoning, we allowed men to have greater variance of performance scores. In this simulation, we are looking for a "maximal effect" which might be attributed to risk-taking. Therefore, the increased variance was used to generate "true" performance scores from a normal distribution, and that score stayed with the person for their entire tenure. The increased variance created some very poor performing men who were quickly filtered out at the first competitions. It also created some excellent performing men who rose quickly to the top. In terms of risk-taking, these men are those whose risks always pay off; they could not lose. A more realistic implementation might be to add random white (zero-centered) noise to the performance score at each competitional stage, representing the effect of risk taking for a single year. When that strategy was implemented, we observed that there was no advantage for men. The results reported herein are for the "maximal impact" scenario where men are given more variation at the time of entry into the company. We encourage readers to interpret results with this caveat in mind: the results are thought to be an upper bound on the effect of variance on stratification, and another choice of implementation strategy reduced the effect to zero. One cannot expect any single explanation for gender stratification to be the sole cause of the phenomenon; rather, one expects several to contribute. We could try all possible combinations of the six effects, but that would involve 26 = 64 possible combinations, made even more complex by the fact that each explanation has at least one adjustable parameter. Instead we center our attention on gender bias for two reasons: it has been demonstrated in experiments and organizational studies, and it has a strong effect, as will be demonstrated below. We will demonstrate that 1% to 5% bias does not produce the strong stratification observed in actual organizations, so we then add in other explanations: more bias, or one of the other five possible reasons for stratification. In this paper combinations of more than two explanations will not be examined. The simulation runs involving bias and another explanatory parameter were conducted in order to examine the potential for each explanation to affect stratification in conjunction with bias. An obvious explanation which we are not currently investigating is the inertia of organizations which a few decades ago were entirely staffed by males. The fact that women's progress seems to be slowing rather than accelerating in recent years makes us look for other explanations. In evaluating the simulation itself, the ability to describe a company in a steady state must be demonstrated before it is used to model a company in transition. The key points of this simulation structure are that we use a discrete clock for the years of a corporation's life. The size and structure of the corporation are fixed for any particular run, and the individuals in the company do not make any decisions. Rather, the fate of each (in a series of competitions) is determined by the magnitude of a stochastic score — those with higher scores win and are promoted. Further details on the above choices follow. For the purpose of examining gender stratification, it suffices to view annual snapshots of the company. Therefore a discrete clock was used with all promotions occurring in one "cascade" starting at the top of the organization and working down. Openings at the bottom level are filled with new recruits having a performance score drawn from a standard Gaussian distribution, N(0,1). That true score stays with the person throughout her/his entire career, although measurement error noise might be added for a particular promotional competition to mimic the measurement error inherent in performance evaluations. A person will be promoted at most one time per calendar year. Because the primary interest is in gender proportions by level, lateral transfers can be ignored. At any given level, every manager has the same number of subordinates. That number is referred to as the span of control (Van Fleet and Bedian 1971). An external hire may be brought in to fill an open position, and the decision to do so is made at random based on the probability of external hire at a given level. To ensure that the new person is suitable, we simply clone someone already at the level of the opening, add a small amount of random (Gaussian) noise to the performance score, and reset gender (again randomly according to another input for the given level). all people at the level just below the opening (the "unconstrained" pool). Note that when the strictly constrained pool is used, even a very capable person will be denied promotion if her/his immediate superior does not move up or retire. At the other extreme, the most capable people are identified and promoted most quickly when the unconstrained pool is in effect. As described above, the basic performance score is drawn from a N(0,1) distribution at each person's creation and stays with the person for their entire career. After the applicant pool is identified, any bonuses and any penalties are added to the individual performance scores. The person with the highest modified score is promoted to the open position. The modified scores are not stored, but can be recreated from the individual components and the other inputs used in a particular run. Because the corporate policy toward promotions is of interest, not outcomes at the individual level, the people in the company do not make decisions or have strategies. Instead, stochastic choices are made for them, such as whether to leave the company or to stay. People leave the company for one of three reasons. Age When a new person is created, a maximum "career length" in years is generated from the distribution shown in figure 1. We assume that managers enter the work force at age 21, and retire automatically when retirement age is reached. Lack of Opportunity If a person stays too long in a position, they are thought to have missed promotional opportunities, and become sidelined with decreased chance for promotion. Becoming sidelined is thought to encourage people to leave the company, so when a person stays at a given level for more than a certain number of years (length of optimal time window is an input parameter) their probability of leaving is increased by an amount which can be specified for each level. A special case occurs with the vice presidents (VPs) (just below the CEO). When a new CEO is needed, we consider all VPs to be competing for the vacancy. When the decision is made and a new CEO is hired, then the VPs who lost the competition will all leave the company the following year. Random All other reasons for leaving, such as personal/family, health, switching to another company, etc. are combined into this category. Attrition proportions are input for males and for females at each level of the company. If that value is, say, 4%, then each year 4% of the people at that level and of that gender are picked at random to leave. The size and structure of a company are expected to strongly affect the degree of stratification. In a company with more vertical layers there are more competitions as one progresses from entry level management to the CEO position. Furthermore, the spans of control directly influence the size of the candidate pools in which the competitions take place, so reasonable values are needed. Axtell (2006) argues that company sizes follow a highly skewed (zipf) distribution, but does not provide a model of the internal structure and levels of organization. Rather than generate company sizes at random from such a distribution, we will target US Fortune 500 companies. From 2006 Fortune report (Fortune 2006) we see that Wal-mart is an outlier with 1.8 million employees and that the second to tenth largest corporations employ 447K to 303K employees. To extract a number of managers from the total number of employees we rely on Hurley-Hanson et al (2005) who provide a breakdown of management ranks shown in table 1 for a company of approximately 200K employees. Total size of 200K employees puts this company among the 15th to 20th largest employers in the Fortune 500, so it will be taken as representative of the larger corporations. The simulation assumes a constant span of control for each level, which changed our total slightly to the 27531 shown in table 2 under the "Large" company. To define a medium sized company, we started with the median Fortune 500 size of 26000 and reduced it by the same proportion as observed by Hurley-Hansen to get a target of 3528 managers. We obtained a similar number, 3578, by removing one level of management from the large company and decreasing spans of control slightly. A typical "small" Fortune 500 company was obtained by choosing the 10th percentile of the distribution of Fortune 500 company sizes, (5600 employees), and again using 13.6% in management. In each case, the numbers show that a majority do not get promoted to the higher levels of the company, and that the competition will be intense to get to the upper levels. Next we will describe some of the technical details of the simulation. The simulation was built using the R environment, (R Development Core Team 2005), a high level language especially well suited for matrix computation, generation of random numbers and easy creation of plots. R allows but does not require the use of objects similar to Java, Objective C, or C++ objects, but differs in that functions are more integral to the language. Though R is an interpreted language and was expected to be slow, vectorized functions allow the avoidance of loops, greatly speeding up execution. An earlier version using objective C and the Swarm libraries (Swarm Development Group 2005) was much slower. R has been used previously for individual-based modeling of ecological systems (Petzoldt 2003). In this implementation, a company is represented by a list of positions (ordered by level), and a data matrix of people containing all attributes (gender, performance score, time-in-rank, etc.). The two structures inter-relate in that one attribute of a person is her/his position in the company, and the sole attribute of a position is its person (a specific row in the people matrix). Figure 2 shows the graphical representation of the company. Each individual is represented as a rectangle with color determined by gender (red for females, blue for males) and shade determined by performance score. Those with higher scores are darker than those with low scores. As we loop through the years, the following sequence of events takes place in each year. Increment age by one for all employees. Identify openings due either to attrition or to attainment of retirement age. If an external hire will be made, clone one of the people already at that level, adding some noise to the performance score, and reset the clone's gender at random according to an input probability of male. Use one of the rows in the people matrix vacated by a retirement to store the new hire. Skip the next three steps. For internal hires, identify the candidate pool for each opening. Add any bonuses to and subtract any penalties from each candidate's performance score, creating a modified score. Promote the person with the highest modified score, removing the newly filled position from the list of open positions, and adding the vacated position to the list. If the graphics window is used in "demo" mode, show the open position as blank, and have the winner move up and over to the open position. (External hires are shown coming in from the sides.) In this animation, a three-level company is shown with two openings at level 2. One is filled by a promotion from within, the other by an external hire. A simulated company is created and operated based on many input parameters. Inputs which change with every level are stored in a parameter file. Those which are constant across levels, and those which govern graphics and output are specified in a command line. The complete list of input parameters is given in Appendix A.
Outputs written to files include the mean proportion of women at each level. Report frequency is specified by providing a starting year and a reporting interval. Annual reports are an option, but because people tend to stay in positions for a number of years, we typically use 5 year reporting intervals. For validation purposes, the program can save a description of each promotion winner in a text file and, in another file, information about why each person left can be recorded. The focus for this article is on equilibrium states rather than transitional states, so a 50 year burn-in period was used. Mean performance scores were plotted across years 50 to 60 for each level, and regressions of mean score versus year were run for each level over the same span of years. For large companies, slope estimates varied from -0.0015 to 0.003, in medium-sized firms from -0.00075 to 0.0083, and for small companies, from -0.003 to 0.0013. In the lower levels, the means are computed over thousands of people and have very small variances. Therefore it is not surprising that a few of the low level slope estimates are more than 2 SEs from 0. However, because the magnitudes of the slopes are so small and sample sizes are so large, this is a case where p-value based hypothesis testing for zero slope (or confidence interval inclusion of zero) is not appropriate because even very small differences will test as significant. Based on the small slope estimates, we conclude that after 50 years mean performance by level is not changing and that an equilibrium state has been reached. All plots and summaries below are based on multiple simulation runs (5 for large, 7 for medium, and 10 for small companies) run over long periods of time to ensure that an equilibrium state had been reached. Changes in mean performance score and other observable characteristics stabilized in 50 years, but sample sizes for CEOs were small, resulting in unacceptably wide confidence intervals for proportion female at the upper level. To obtain larger sample sizes, rather than start more runs (with 50 year burn in periods), we ran the 5, 7, or 10 runs for longer time periods (500 years), and stored information about the CEO only when a new CEO first appeared. In choosing parameter values for the runs presented here, our objective was to explore "local" areas of the parameter space. Our first area of interest is the amount of bias reported in experiments, ranging from 1 to 5% in terms of r2 of performance scores. Secondly, throughout the discussion of results, we will be referring to "target" values of gender segregation as the 16.7% women in the upper levels (board elected or approved) and 1.6% women CEOs reported in Catalyst (2006). We find that the 1 to 5% range for biases does not result in proportions of women near the top as low as the target. Therefore we will expand the search for parameters which depress the proportion female further, first by adding more bias, then by adding in other effects. Exact parameter values are not of particular interest, rather we are examining the concepts to determine if any values for the additional parameters result in increases of stratification to the target level. If some parameter values do depress proportions female to the target level, the reasonability of such parameter settings will be discussed. Figure 3 is a trellis plot (Cleveland 1993) wherein multiple panels are used to convey information about different company sizes and different candidate pool types. Within each panel, levels increase from level 1, the entry level, to the CEO level (7, 6, or 5, depending on company size) and the lines connect proportions female for a given percent bias. The intervals shown are approximate 95% confidence intervals for the proportions. The panels are arranged so that large companies are in the first column, middle in the second, and small in the third. The candidate pools are in the rows and progress from most open (in the bottom row) to strictest (top row). 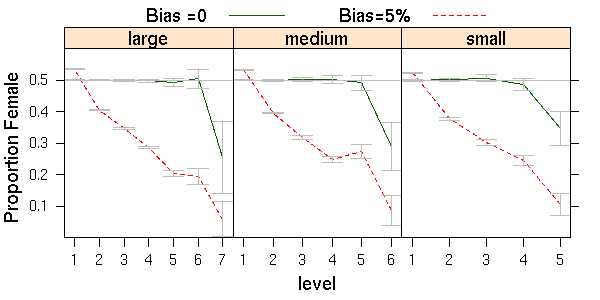 From figure 3 we note that bias has a strong effect as judged against the gray horizontal line at 50%. The first level has more than 50% women because relatively more women than men are detained in level 1. 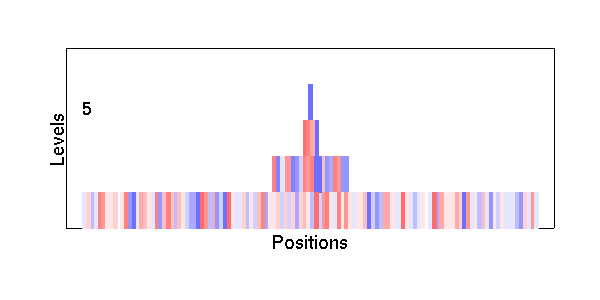 The more open candidate pools (middle and bottom rows) show faster rates of decline in proportions female. It is also true that mean performance scores increase more steeply with level for unlimited pools than for strict or limited pools. (Data available upon request.) Decreases in proportions tend to flatten out at the level just below CEO. This is an artifact of a special attrition rule implemented only at that level. When a new CEO is hired, the next level down (VPs) will all leave in the following year. Promoting a large batch of people at one time uses up a greater proportion of the candidates, making the new VPs look much like the level just below them (little filtering is taking place). Smaller companies tend to have higher proportions female in the upper levels, which is sensible because fewer competitions take place between the bottom and the top of the company and because candidate pools are typically smaller than with larger companies. Variability naturally increases with level because lower levels contain far more people. Finally, note that even with 5% bias the proportions female are above the 17% target for the upper levels. In what follows the three candidate pools will not all be examined; instead we take an intermediate strategy: using limited candidate pool for the bottom half of the company, and the unlimited pool for the top half. (Note that for CEO, all candidate pools include all the VPs; there is no difference between unlimited, limited, or strict pools.) We now look for ways to increase the stratification by applying more bias. Figure 4 compares 5% bias to biases which increase by 1% with every level to a maximum of 10% at the CEO level. It illustrates that more bias will reduce the proportion women at upper levels. For large companies the proportion women being promoted into levels 5 and 6 was then 12%, for medium-sized companies, 17% women were promoted into ranks 4 and 5, and in small companies, only 17% of the promotions into level 4 were of females. According to the latest Catalyst report (2006), in the upper levels of the company, women hold 21.1% of the staff positions, and about half as many, 10.6% of the line positions. Because CEOs are almost always drawn from line positions, the "glass wall" between the two parts of the company ensures that the proportion of women CEOs will be no more than the proportion of women in line positions. To simulate such a company, we split our virtual company into equally-sized line and staff divisions at the level just below CEO. The two divisions are run as independent companies with different input values for proportion female at the bottom level (assumed to be 70% women in staff, 30% women in line). When choosing a new CEO, an input parameter controls the proportion of the time the CEO is drawn from the line division (typically set at 0.99). After determining at random whether the CEO will be line or from staff, the best candidate from the chosen division is selected and promoted. Figure 5 shows that by itself, the line-staff division reduces the proportion of female CEOs to 25-30%. When combined with 5% bias, only 5% of the large, 8% of the medium, and 10% of the small company CEOs were female. At the VP level percents female were 19, 27, and 24 percent (large, medium and small companies, respectively). By itself, differential attrition rates caused proportions of women to drop to about 40% in the upper levels. Combined with 5% bias, we observed 14% of the CEOs and 16% of the VPs were women in small companies. Medium companies had 15% and 11% women at the top, and large companies were led by women 5% of the time with 3% of VPs being women. To examine the effect of career delays, we gave women a probability of one-fifth of taking a "year off" in any specific year of the simulation (subsequent years-off occurred independently with the same probability), then applied a penalty of -1 to the score of anyone who stayed 5 or more years at the same rank. Additionally, those moving up in year 3 were given a bonus of .5, those moving up in years 2 or 4 a bonus of .25 in the performance score scale. Just the 20% probability of delay reduced the proportions of women to about 40%. Combined with 5% bias, we observed: 6, 13, and 16% of CEOs were women, at the VP level, 11, 18, and 21% were women (for large, medium, small companies). The percentages of women are surprisingly similar to the 5% bias lines in figure 4, indicating that the penalty and bonus were not strong enough to disadvantage women further, or that it is not hard for the few exceptional women who rise to the highest ranks to make up for the one-year delay. Companies were given a moderately strong preference for external hires: 30% at the CEO level, reducing to 5 and 10% at the level two. The proportion of men in the external pool was set to 85 and 90% at the CEO level, building up gradually from the lowest level, which was still divided evenly. Figure 8 shows that declines in the proportion female are modest when there is no bias, and that with 5% bias 1, 19, and 14% of the CEOs were female (large, medium, small) and at the VP level, 16, 18, and 17% were women. To mimic a tendency to take more risks, men's true performance scores were made more variable than those of the women, increasing the SD from 1.0 to 1.2. In figure 9 we see the results, percentage of women CEOs are 4, 7, and 14 (large, medium, small) and of the VPs, 16, 16, and 21% are women. This is one effect which is of similar magnitude to the bias effect. When combined with 5% bias, proportions of women drop to 1, 2, and 6% of the VPs and 0, 2, and 1% of the CEOs (large, medium small companies respectively). The investigations we have described are an attempt to calibrate a simulation against data observed on real companies. The questions we have addressed are simple ones: "Are there reasonable settings for the parameters we have created which produce gender stratification in simulated companies similar to that observed in today's Fortune 500?" A useful summary measure plotted in figure 10 is the proportion of women in the VP level, just under the CEO. In the left-most panel, the triangles are for 5% bias alone, and the circles are for increasing bias. In each of the other panels, the circles are for another effect by itself and the triangles are for the same effect combined with 5% bias. Bias in performance evaluations is of particular interest in that other studies suggested reasonable levels of bias. Using 5% bias we almost achieve the target level of stratification, and by increasing bias with level, we can obtain very strong stratification. We chose an even split between line and staff based on data in the Catalyst (2006) report, then set up the line side to have less than half as many women as the staff side (30 versus 70%), while maintaining a 50-50 ratio over the entire bottom level of the company. By itself, there is little effect on proportions of women at the VP level, and when combined with 5% bias, we see basically the same results we saw for 5% bias alone. 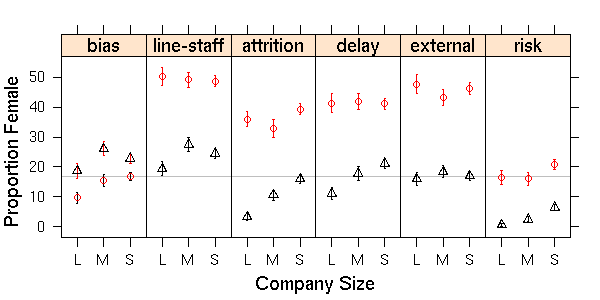 The real effect of line-staff division should be measured at the CEO level because it is only there that the two divisions merge together, however, figure 5 did not show any change at the CEO level due to line-staff divisions, probably because the women who do make it as far as VP on the line side are competitive with the men in line. Returning our attention to figure 10, for the other proposed explanations we did not have parameter values suggested by research, so we searched for values which depress the proportion of women VPs to about 17%. If any of these explanations do reduce the proportion female to that low level for some particular setting, we make no claim that such a value is occurring in reality. Rather, we leave to the reader the judgment as to whether or not such a value could occur in an actual company. In that way, the simulation could be used to focus data collection efforts in corporate settings on measurements of corporate qualities which have the potential to induce or reduce stratification. Proportions female vary with the size of the company, and without knowing the numbers of managers in each level of each Fortune 500 company, it is not possible to achieve the 17% female target. Therefore we were content to get close to the target, anywhere between 15 and 20% female. As reported above, 5% bias by itself and increasing bias do depress the proportion female to near the target level. Among the other explanations, increased variance of performance scores for men (risk) stands out as a second explanation which might produce the glass ceiling. The increase of 20% in standard deviation for men's performance scores used to achieve this stratification, however, may be unrealistically high. Moreover, as pointed out in 2.8, the implementation chosen does amplify the effect. The simulation results suggest that empirical investigations of gender differences in performance score variance would be a valuable addition to the knowledge base. By increasing the rate of female attrition, we were able to create some stratification, and combined with 5% bias, this produced a strong effect at the VP level. However, we used an attrition rate for women which was ten times that for men at the upper levels. A ten-fold increase is unrealistically high. Similarly, one-year career delays for one-fifth of women produces a modest effect by itself, and the target reduction when combined with bias of 5%, however the rate of delay is certainly too large to be realistic. Finally, the use of an external labor market highly skewed in men's favor also produces the target level when combined with 5% bias. More investigation is needed to determine if these levels of skew in the distribution are reasonable. In conclusion, we note that this is a preliminary investigation. We have only looked at single explanations and at five combinations of two explanations. In reality, we expect that all explanations may have some degree of truth to them. Our choices of simplifications of reality to build a computer model have certainly influenced the results. This is most obvious when looking at line-staff split, because we assumed that the two divisions operate completely independently even at the VP level. Only when hiring a new CEO is there recognition of the fact that some managers are from line and some from staff, and only there is the preference for line used. Further work is needed to examine more realistic combinations of the possible explanations using reasonable values for the various parameters. We also plan to determine if the simulation can be used for modeling transitional states, rather than simply equilibrium states. Ideally, the simulation program could be used to examine corporate strategies (affirmative action, bias reduction techniques, and others) which could reduce gender stratification and insure that the best candidates are the ones who get promoted. An argument for increasing the diversity of a work-group (in our case the upper level of management) has been advanced in Palmer (2006) where a simulation was used to illustrate increased work-group performance at moderate levels of diversity. Gender stratification does limit diversity in one important dimension. Necessarily, one must be careful when making inference about corporations based on a computer model. A simulation can generate hypotheses about possible effects of certain decisions, but testing a hypothesis with a simulation requires an element of faith in the simulation -- that it accurately includes all relevant aspects of the actual system. <!-Acknowledgements here --> This research was supported by NSF grant 0234350. Thanks to Pete Martone for discussions which clarified numerous coding issues, and to the anonymous reviewers whose comments have strengthened the exposition. Copies of the R code are available from the first author. Length of time to run the company. Recording intervals and time to begin recording. where pm is the proportion of males at a given level. Options for storage of company history. Proportion of women to delay for one year. AXTELL, R.A. (2006) Firmsizes: facts, formulae, fables and fantasies. Technical report, The Brookings Institution, Washington, D.C.
BRETT, J.M. and L.K. Stroh (1997) Jumping ship: Who benefits from an external labor market career strategy? Journal of Applied Psychology, 82 pp. 331-334. CATALYST (2006) 2005 Catalyst census of women corporate officers and top earners of the Fortune 500. Technical Report, Catalyst. CLEVELAND, W. (1993) Visualizing Data. Hobart Press. COX, T.H. and C.V. Harquail (1991) Career paths and career success in the early career stages of male and female MBAs. Journal of Vocational Behavior, 39 pp. 54-75. DAVIDSON, M. and Burke, R.J. (2000) Women in Management: Current Research Issues, volume II. Sage, London. EAGLY, A.H., M.G. Makhijani, and B.G. Klonsky (1992). Gender and the evaluation of leaders: A meta-analysis. Psychological Bulletin, 111 pp. 3-22. FORTUNE (2006) How the companies stack up. Fortune, 153 pp. 28-31. HURLEY-HANSON, A. E., S. Wally, S.L. Segrest Purkiss and J.A. Sonnenfeld (2005). The changing role of education on managerial career attainment. Personnel Review, 34(5) pp. 517-533. KONRAD, A. and J. Pfeffer( 1991). Understanding the hiring of women and minorities. Sociology of Education, 64 pp. 141-157. LYNESS, K.S. and M.E. Heilman (2006). When fit is fundamental: Performance evaluations and promotions of upper-level female and male managers. Journal of Applied Psychology, 91(4) pp. 777-785. LYNESS, K.S. and M.K. Judiesch (1999). Are women more likely to be hired or promoted into management positions? Journal of Vocational Behavior, 54 pp. 158-173. MARTELL, R.F., D.M. Lane, and C. Emrich (1996). Male-female differences: A computer simulation. American Psychologist, 51 pp. 157-158. OLIAN, J., D. Schwab, and Y. Haberfield (1988). The impact of gender compared to qualifications on hiring recommendations. Organizational Behavior and Human Decision Processes, 41 pp. 180-195. PALMER, V. (2006). 'Simulation of the Categorization-Elaboration Model of Diversity and Work-Group Performance'. Journal of Artificial Societies and Social Simulation 9(3)3 http://jasss.soc.surrey.ac.uk/9/3/3.html. POWELL, G N and L A Mainiero (1992). Cross-currents in the river of time: Conceptualizing the complexities of women's careers. Journal of Management, 18(2) pp. 215-228. RICHIARDI, M, R Leombruni, M Sonnessa, and N Saam, Nicole (2006). A Common Protocol for Agent-Based Social Simulation. Journal of Artificial Societies and Social Simulation 9(1) 15 http://jasss.soc.surrey.ac.uk/9/1/15.html . R DEVELOPMENT CORE TEAM (2005). R: A language and environment for statistical computing. R Foundation for Statistical Computing, Vienna, Austria. http://www.R-project.org. 3-900051-07-0. ROSIN, H.M. and K. Korabik (1990). Marital and family correlates of women managers: attrition from organizations. Journal of Vocational Behavior, 37 pp. 104-120. SCHUBERT, R. (2006). Analyzing and managing risks - on the importance of gender differences in risk attitudes. Managerial Finance, 32(9) pp. 715. STROH, L.K., Brett, J.M. and Reilly, A.H. (1992). All the right stuff: A comparison of female and male career patterns, Journal of Applied Psychology, 77 pp. 251-260. SWARM Development Group (2005). Documentation Set for Swarm 2.2. Santa Fe, New Mexico. http://www.swarm.org. SWIM, J.K. and L.J. Sanna (1996). He's skilled, she's lucky: A meta-analysis of observers' attributions for women's and men's successes and failures. Personality and Social Psychology Bulletin, 22(5)pp. 507-519. SWIM, J.K., E. Borgida, G. Maruyama, and D.G. Myers (1989). Joan McKay versus John McKay: Do gender stereotype bias evaluations? Psychological Bulletin, 105 pp.409-429. VAN FLEET, D.D. and A.G. Bedian (1971). A history of the span of management. Academy of Management Review, 2 pp. 356-372. WELLINGTON, S., M.B. Kropf, and P.R. Gerkovich (2003) What's holding women back? Harvard Business Review, 81(6) pp. 18-19.